Like human beings thinking about the Trinity, it's the best we can do, I think, for now. But the getting there is such fun! The greatest minds of Christendom have applied reason, philosophical rigor, depth and breadth to understanding and interpreting the the church's experience of “Father” “Son” and “Holy Spirit”. But in the end, knowing God is as illusive as predicting a firefly's trajectory over a field of hay after dusk, as futile as keeping track of a drop of rain fallen into the ocean in a storm, as blinding as gazing directly at the sun. But contemplating Trinity offers lessons in the dynamism of creation, incarnation, delight, genesis, the inter-relationship of being, of nothing, of everything, of darkness, of light. Image. Silence. And, again, nothing. This week’s gathering of quotes draws from the classic mystics: The Cloud of Unknowing (one), and Julian of Norwich (two) emphasize the personal reliationship to Divine Love, an intimacy through which, says Ruysbroeck, we become the very breath of God (three). The Last Word (contemporary theologian Thomas Berry) sends us off to consider the relational universe and its implications. Now you say, "How shall I proceed to think of God as he is in himself?" To this I can only reply, "I do not know." With this question you bring me into the very darkness and cloud of unknowing that I want you to enter. A man may know completely and ponder thoroughly every created thing and its works, yes, and God’s works, too, but not God himself. Thought cannot comprehend God. And so, I prefer to abandon all I can know, choosing rather to love him whom I cannot know. Though we cannot know him we can love him. By love he may be touched and embraced, never by thought. Of course, we do well at times to ponder God’s majesty or kindness for the insight these meditations may bring. But in the real contemplative work you must set all this aside and cover it over with a cloud of forgetting. Then let your loving desire, gracious and devout, step bravely and joyfully beyond it and reach out to pierce the darkness above. Paradoxically, the One moves from itself into the Three and yet remains One, while the Three return to the One and yet remain Three. 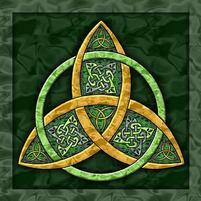 The single divinity of the Trinity is undivided and the three Persons of the one divinity are unconfused. We confess Unity in Trinity and Trinity in Unity, divided yet without division and united yet with distinctions. In the seventh dwelling, everything is new. Now our great God is ready to remove the scales from the eyes of the soul so that she can see and understand something of the blessing he is granting her. He does this in a strange and inexplicable way. The soul enters the innermost chamber through a transcendental vision of the three divine Persons, which imparts to her a particular representation of truth. At first, an incredible clarity descends on the soul like a luminous cloud, setting her spirit on fire and illuminating each of the three aspects of God individually. At the same time, through a wondrous kind of knowledge, she apprehends the truth that all three divine Person as are one substance and one power and one knowing and one God alone. The soul realizes then that what the rest of us know by faith, you might say, she understands by sight. But this is not a seeing with the eyes of the body or even the eyes of the soul. It isn’t a visual revelation. Here, all three Persons communicate themselves to the soul. They speak to her, explaining things, like what Christ meant in the gospels when he said that he and the Father and the Holy Spirit come to dwell inside the soul who loves God and honors his ways. Oh, Lord help me! There’s a big difference between believing these words by hearing them and being led to understand the truth they represent in this direct and wondrous way! The soul is more amazed every day as she discovers that these divine Persons never leave her anymore. Through this sublime knowing she clearly sees that they are with her always. She perceives their sacred presence in a radically inner place, inside her own depths. She just hasn’t learned the language to be able to explain this knowing. You may think that an experience like this would propel the soul beyond herself, that she would become so absorbed she could focus on nothing else. Actually, when it comes to doing anything relating to serving God, she is more present than ever before. As soon as she finishes such a task, she rests again in that divine companionship. Can anyone comprehend the almighty Trinity? Everyone talks about it- but is it really the Trinity of which they talk? Rare indeed is the person who understands the subject of his discourse, when he speaks of that. People argue and wrangle over it, yet no one sees that vision unless he is at peace. I wish they would turn their attention to the triad they have within themselves. It is, to be sure, a triad far distant from the Trinity, but I propose it as a topic on which they may exercise their minds, by way of experiment and in order to make clear to themselves how great the difference is. The triad I mean is being, knowledge and will. I am, and I know, and I will. Knowingly and willingly I exist; I know that I am and that I will; I will be be and to know. Let anyone with the wit to see it observe how in these three there is one inseparable life: there is one life, one mind and one essence. How inseparable they are in their distinctness! Yet distinction there is. Everyone has himself readily available for inspection; let each, then, scrutinize himself, and see what he can find, and tell me. But when he has verified this unity between his powers, he must not suppose that what he has discovered is that which exists immutably above our creaturely minds, that which unchangeably is and unchangeably knows and unchangeably wills. 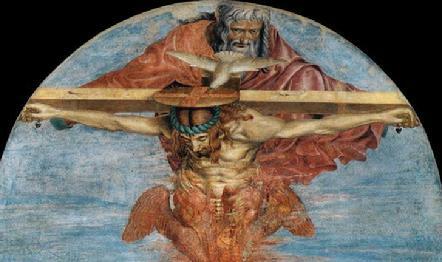 Do these three coexistent acts constitute the Trinity? Or are all three found in each Person, so that each is this triple reality? Or are all three found in each Person, so that each is this triple reality? Or are both these propositions true, the simplicity and the complexity being reconciled in some way beyond our comprehension, since the Persons are defined by their mutual relationships yet infinite in themselves? Thus the Godhead exists and is known to itself and is its own all-sufficient joy without variation for ever, Being-Itself in the manifold greatness of its unity. Who can find any way to express this truth? Who dare make any assertion about it? Knowing the Trinity is being involved in this circling movement: drawn by the Son towards the Father, drawn into the Father�s breathing out of the Spirit so that the Sons� life may be again made real in the world. It is where contemplation and action become inseparable. As verily as God is our Father, so verily God is our Mother; and that shewed He in all [her revelations] and especially in these sweet words where He saith: I it am. That is to say, I it am, the Might and the Goodness of the Fatherhood; I it am, the Wisdom of the Motherhood; I it am, the Light and the Grace that is all blessed Love; I it am, the Trinity, I it am, the Unity: I am the sovereign Goodness of all manner of things. I am that maketh thee to love: I am that maketh thee to long: I it am, the endless fulfilling of all true desires. And that same Father says to each soul in His infinite loving kindness, "Thou art Mine and I am thine: I am thine and thou art Mine, for I have chosen thee from all eternity." … When we unite ourselves to God by love, then we are spirit: but when we are caught up and transformed by His Spirit, then we are led into fruition. And the spirit of God Himself breathes us out from Himself that we may love, and may do good works; and again he draws us into Himself, that we may rest in fruition. And this is Eternal Life; even as our mortal life subsists in the indrawing and outgoing of our breath. but a communion of subjects. I love that the collects of the prayerbook guide the devotee to pray to God, through Christ (the Son), in the Holy Spirit. That shaping of prayer imprints early in childhood, and imbeds within members of the liturgical church a deeply rooted relationality, a continuous motion, a perpetually open system, and an intimacy with both transcendence and immanence even as the child unthinkingly rattles off her evening prayers without particularly paying attention. Once trained in the Trinity, it's not a great leap to consider the God of multiple dimensions, multi-universes, string theory, and hyperspace. Opening to new perceptions of God's self-revelation is as natural as contemplating innovations in theoretical physics. As I learn and grow I can open to God's Reality more fully if ever increasingly more humbly. Awe deepens. And yet. When you pray, it seems Love surfaces from the deep place where the soul touches the universe. Is that right? Does the soul touch the universe? If that love comes not from something outside but something deep within only, then I am simply made for love. Whether God exists or not, Love lies at the heart and meaning of human life; dynamic, relational, intimate, challenging, open Love. And the deep wisdom of the Trinity is our Mother, in whom we are enclosed. 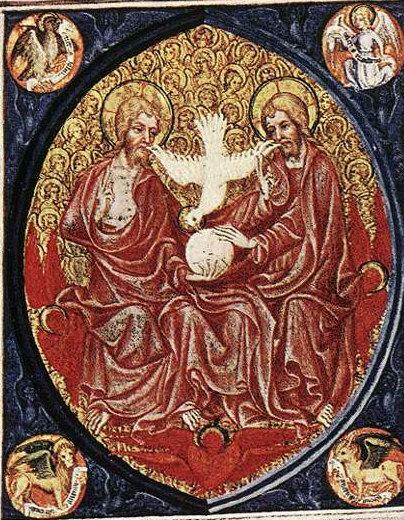 And the high goodness of the Trinity is our Lord, and in him we are enclosed and he in us. We are enclosed in the Father, and we are enclosed in the Son, and we are enclosed in the Holy Spirit. And the Father is enclosed in us, the Son is enclosed in us, and the Holy Spirit is enclosed in us, almighty, all wisdom and all goodness, one God, one Lord. 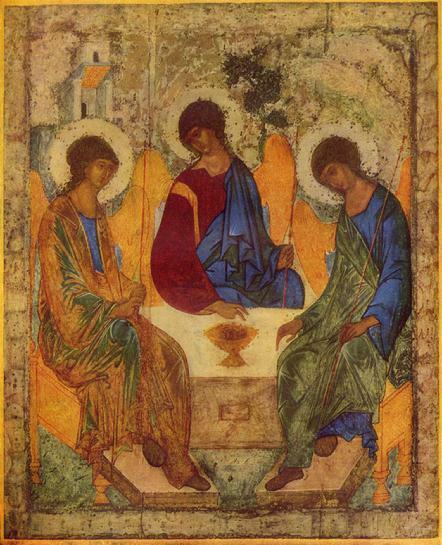 Trinitarian life is also our life...There is one life of the Triune God, a life in which we graciously have been included as partners... a comprehensive plan of God reaching from creation to consummantion, in which God and all creatures are destined to exist together in the mystery of love and communion.